The Arlington County Board voted to eliminate the requirement to display a decal beginning July 1, 2019. Read here for details. You must have a yellow decal on your windshield until July 1, 2019. The Board vote does not affect this requirement. For information solely about the local Motor Vehicle License Fee, please read here. 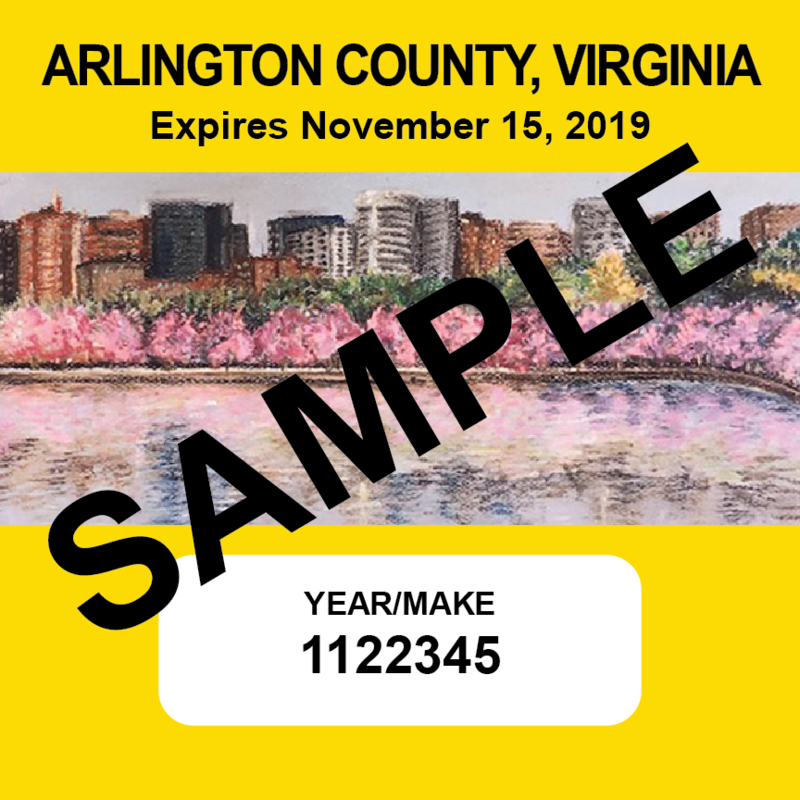 Until July 1, 2019, Arlington County Code requires a County decal to be displayed on the front windshield of every vehicle within 30 days of purchasing the vehicle or moving it into the county. 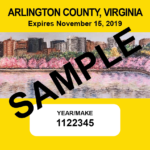 Through June 30, 2019, Arlington County Police will ticket all vehicles garaged, stored, or parked in Arlington County that do not display a valid County decal. Register your vehicle with the Commissioner of Revenue’s Office. The motor vehicle license fee — $33 for most vehicles — will be included on your Vehicle Personal Property tax bill, which will be mailed to you in August. Registering your vehicle with the Commissioner of Revenue’s Office will generate a decal that will be mailed to you within two weeks. If you register your vehicle online, you will have an option to print a temporary decal to use until yours arrives in the mail. You may also come to the Treasurer’s Office to pick up a temporary decal in person. Note: You must pay all personal property taxes and any outstanding debt, including parking violations, to receive your vehicle decal from the Treasurer’s Office. If it has been more than two weeks or you did not receive a County decal with your bill, please click here. 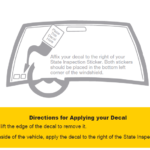 The decal should be placed on the inside of your windshield in the lower left corner (driver’s side), to the right of your Virginia State Inspection sticker. Effective January 1, 2018, Virginia state inspection stickers should no longer be affixed to the bottom center of a vehicle’s windshield. The state inspection stickers will now be placed in the bottom left corner of the windshield, when viewed from inside the vehicle. Existing Virginia vehicle inspection stickers are to remain in their current position — in the bottom center of the windshield. 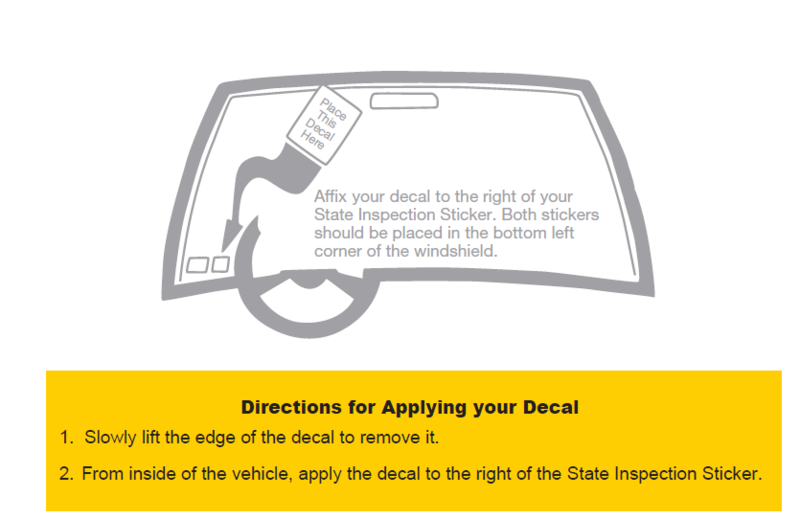 Once a vehicle is inspected and issued a 2019 sticker, the new inspection sticker must be placed in the lower left corner, which is consistent with other states across the nation. The requirements related to Arlington County decals as set forth in the County Code §14.2-71 “Display of License Tags” remain unaffected, requiring that Arlington County decals be affixed to the inside of the windshield of a motor vehicle and placed adjacent to the State inspection sticker and no higher than three (3) inches from the bottom of the windshield. However, during the transition period, January 2018 through December 2018, it is acceptable for an Arlington County decal to be located in the center of the windshield or adjacent to the Virginia state inspection sticker. Police officers and Public Service Aids will allow latitude in the position of the decal until January, 1, 2019. Vehicle Personal Property bills were mailed in August 2018. The yellow decal should have been on the back of your bill. If a decal was not affixed to your bill, please read here to learn why and what to do. The artist of the last decal is Schuyler Workmaster, a 12th grader from Bishop Denis J. O’Connell High School. Schuyler’s pastel drawing is entitled “The Arlington Skyline and Potomac River.” For more information on Schuyler and on the competition, please read here. To see all of the submissions and descriptions from the last decal design competition, please visit here. Please contact Stephanie Shea for more information at 703-228-3807 or sshea@arlingtonva.us. Arlington began requiring local licensing of vehicles in 1949, which took the form of a metal tag attached to the license plate. The first windshield decal was issued in 1967; decals were first produced with a color image in 2000. In 2003, residents were given the opportunity to vote on the image, and in 2005 the Treasurer’s Office started the Decal Design Competition for high school students.